Bev Hennessy is the director of the Village Art Workshops. In this position, Bev has promoted the hiring of nationally renowned art instructors to raise the level of art knowledge and capabilities of art students throughout The Villages and surrounding area. The end result is a nationally recognized Villages art program, the emergence of many successful artists and an increasing level of art appreciation in The Villages. Bev established this website and created the informative newsletter, "The Brushstrokes," to support Village Art Workshops. To get information regarding the workshops, explore this website or contact Bev at the phone number on the left or by completing the Contact Form below. Upon moving to The Villages, Bev entered into the art community by taking several courses in applied art at the Village Art Workshops. 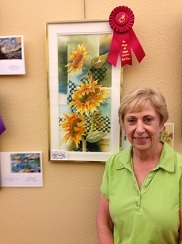 Bev has received several awards for her art including a display of her work in the Appleton Art Museum and acceptance into the Florida Watercolor Society online show. Bev's previous experience includes managing her own successful Pottery business and various management positions in the medical health system.